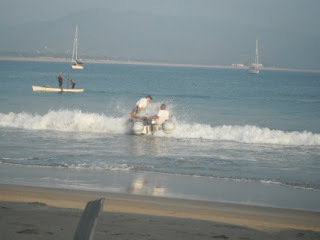 Nothing about our impending sailing expedition to Mexico seemed quite as scary as landing the dinghy in the surf. People told horror stories about it. We dreaded the day that we would actually have to do it ourselves. So when we hit the first anchorage that had surf at the beach we were pretty darn nervous. On day 1 we sat in the cockpit with the binoculars glued to our faces and watched the 3 or 4 dinghies that had the courage to head into shore. We decided that we really didn’t have to go to the beach that day. On day 2 we figured we’d take a closer look and hopped into our dinghy and meandered along parallel to the beach; just checking it out. Geez….those waves were BIG! We nonchalantly headed back to Vakasa, pretending that we’d never really intended to go into the beach in the first place. By day 3, Rizzo was giving us that “you’d better take me to shore, or else” look, so we grimly decided that it was time. Step 1: Put down the dinghy wheels. OK….no problem…..we have great big, amazing dinghy wheels that should do the trick. In fact, they’re so big and heavy that the poor dinghy won’t plane with the 3 of us in it any more. Step 2: Attach the kill switch to Tony’s wrist so that if the dinghy flips, hopefully he’ll be thrown free and the engine will cut out so the prop doesn’t rip Kathy to shreds. Step 3: Watch the waves and wait for a lull, then go like stink. OK…..GO NOW…..no WAIT….no GO….GO, GO, GO….OH MY GOD!!!!!!!! 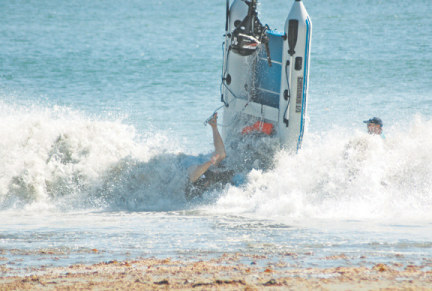 Step 4: Ride the back of a wave and then leap out of the dinghy as soon as it gets shallow enough. Try not to fall flat on our faces. Step 5: Keep the dinghy facing straight into the beach so it won’t turn sideways to the waves and get rolled. Keep it ahead of the wave behind so the stern doesn’t get swamped and/or the bow doesn’t plough into the beach and flip it. Step 6: Run like hell, pulling the boat (which only ways a thousand pounds or so) out of the water; like a couple of commandos (despite that fact that neither of our bodies does “commando” any more!). Step 7: Drag the boat (which now weighs 2 thousand pounds because it’s full of water) up the beach 50 or 60 feet, leading to severe back strain (Tony) and shoulder tendinitis (Kathy). Step 8: Relax….go have a couple cervezas at the palapa bar because we’ve earned it and getting into the beach was the easy part. Launching the dinghy is even harder! We are now exploring the anchorages south of Banderas Bay as we make our way to Barre de Navidad and Manzanillo to meet up with friends, Teresa and Mark for a 10 day visit. We have found some truly beautiful spots on this leg of the journey, with long, golden beaches that go on forever and, you guessed it, lots of surf! Cruisers who have been here season after season say that the surf this year is much smaller than usual (our condolences to Bryn and Tanner) and we certainly aren't unhappy about that. Even though the surf is said to be relatively small, we still get a huge spurt of adrenalin and a good case of nerves when it’s time to…..GO! GO! GO! 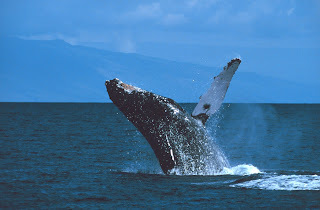 22 whale sightings in 2 days and this was my best shot! Our dinghy, Hoop, named after the African Hoopoe bird that symbolizes a "faithful friend and follower"
These dolphins have been swimming around the boat for 3 days and this is as good as we can do. They are laughing at us! Doesn't look that big, but it can do some damage! Fortunately this isn't us! It's all in the timing and can get rough if you misjudge things! We are safely launched, wheels back up, and heading home...yup, a little wet!